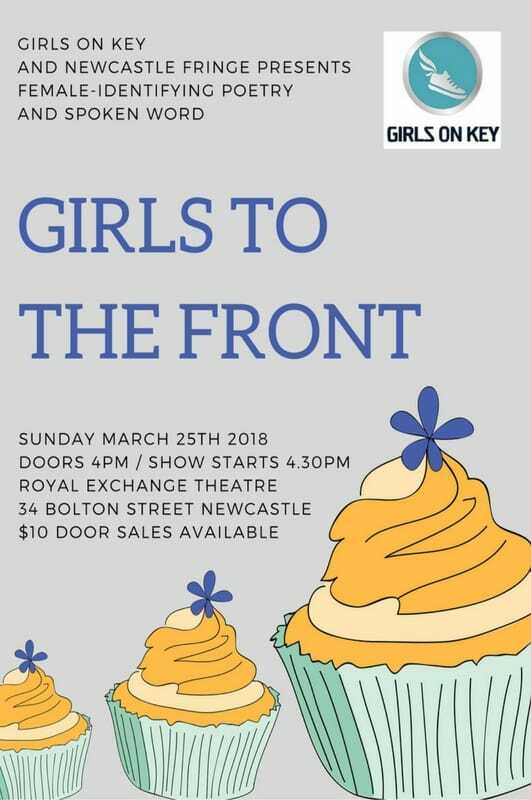 A celebration of female-identifying poets from Newcastle/Hunter region and Sydney. Come and be inspired by the poetry and spoken word presented. Witness the fantastic spectrum of expression. A charity book raffle on the night supports Writing Through Fences, so remember to bring spare change. Door sales only $10. All welcome! 11am to 12pm Yarn Spinners. A celebration of Dymphna Cusack, Florence James and Miles Franklin. Marilla North in conversation with Ann Hardy. 2pm to 3pm From the Page to the Screen. With Vanessa Alexander, Mark Barnard and Michelle Often. Host George Merryman. 11.30am to 12.45pm Inside Publishing. With Meredith Curnow, Benython Oldfield and Geordie Williams. Host Jane McCredie. 2.30pm to 3pm Book Launch. Jan Dean will launch Magdalena Ball’s new book. 3.15pm to 4.15pm Book Launch. Judy Johnson discusses and reads from Dark Convicts her new book. Host Jenny Blackford. 4.15pm to 5.15pm Short and Sweet: Reviving the novella. Nick Earls in conversation with Chris Flynn. 10am to 11am Time Travellers. Historians on their craft with Tom Griffiths and Grace Karskens. 11.30am to 12.30pm Drawn from Life. Poetry inspired by the everyday. With Eileen Chong, John Foulcher and Maggie Walsh. Host Jenny Blackford. 1.15pm to 2.15pm The Importance of Women’s Voices. With Emily Maguire, Sara Mansour, Tara Moss and Tracey Spicer. Host Jane Caro. 3.00pm to 3.00pm Crossing Boundaries. Jaclyn Moriarty in conversation with Emily Booth. I can’t wait and I might see you at one of the many events! What a great success these events have been and I’d like to personally thank Janette Hoppe for creating the Women of Words project and organising the poetry readings. The last event was at Good Brother Espresso Shop and $210 was raised for the White Ribbon Organisation on the day. Dennis Outram from the Maritime Union was the White Ribbon representative and he spoke about the history of the organisation and how the Maritime Union was working hard to raise awareness of the organisation and also to implement policies and procedures in the workplace to make it safer for women. 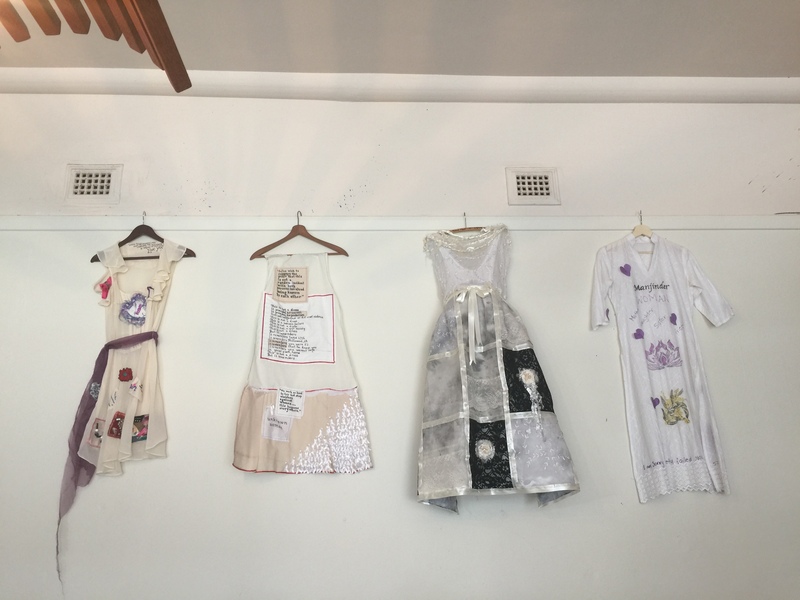 Lisa and Megan from the Remembering the Women project lent us the four dresses which hung on the wall above the poets and represent only a few (to date 68 women) who have been killed by domestic and family violence in Australia in 2016. At Good Brother the place was packed and we had six very special poets to wrap up the month of readings, Georgina Woods, Jean Kent, Kerri Shying, Dael Allison, Linda Ireland and Meg Dunn with introductions and reading by Janette Hoppe. During the first three poetry events a total of $530 was raised for the Hunter Women’s Centre. Hopefully more to come in 2017 and thank you everybody who came along and supported this very important cause. The Women of Words Eat, Stray’d, Love Papatuanuku Press anthology can be purchased from Janette Hoppe at hoponin@bigpond.com or at Pay Pal under the same email address. 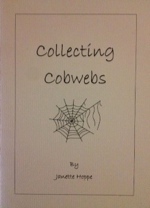 The books are $20 with $10 going to the Hunter Women’s Centre and $10 to the White Ribbon Organisation. Come along to Good Brother Espresso Shop 4-6pm Sunday 27th November to hear some great poetry. Please note that this event is registered with White Ribbon. Please share and spread the word. Thank you for your support. Mauri Ora (In Sacred Breath). Georgina Woods is an activist and poet who was born and raised on Awabakal land, in Newcastle, where she still lives. She has a PhD in English literature from Newcastle University and works in conservation and advocacy against the expansion of the mining industry. Her poem “Water Song” was short-listed in this year’s Newcastle Poetry Prize. Jean Kent has published five full-length collections of poetry. The most recent is The Hour of Silvered Mullet (Pitt Street Poetry, 2015). Her awards include the Anne Elder and Mary Gilmore prizes for her book Verandahs, and the Josephine Ulrick Prize, Somerset Prize and runner-up for the Newcastle Prize for individual poems. She has also received several fellowships from the Australia Council, including two Overseas Residencies in Paris. Paris in my Pocket, an illustrated chapbook of a selection of her Paris poems, was published by Pitt Street Poetry in 2016. Kerri Shying: I am a writer, artist, and mother who belong to the Wiradjuri Jacobs family, and the Chinese Shying family (whose ancestor first came to this country in 1817 and left us behind to thrive). 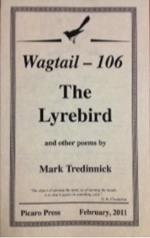 I have won awards for my poetry and prose and write daily on the Project 365 blog. I am nothing without my family and live peacefully in Newcastle with my dog Max and my garden. I live with a chronic illness which disables me – without community nothing comes. 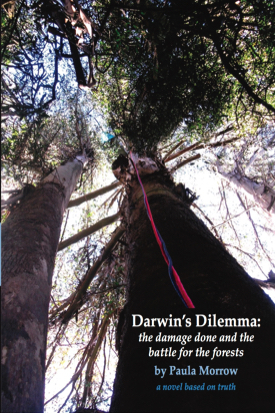 Dael Allison is a writer and editor who is undertaking a Doctorate in Creative Writing at the University of Newcastle. Her work is widely published and poems from her book Fairweather’s Raft featured as a soundscape on ABC radio’s Poetica. Linda Ireland has had work published in several anthologies including ‘A Slow Combusting Hymn’, ‘Collecting Cobwebs’ and ‘All These Presences’. In 2016 she was invited to be a Community Teaching Assistant with Modpo, an international online course on modern American poetry developed through the University of Pennsylvania. A member of Blue Room Poets, Linda has helped establish poetry in the pub in Western Lake Macquarie. She received a Hunter Writer’s Centre award in the 2016 Grieve Competition. Meg Dunn is the offspring of a lighthouse keeper and a mermaid. She believes that poetry when fresh is unacceptable and colours outside the lines – therefore making it the ultimate artform. Even more than painting, it releases the truth in the most personal of ways. Anyone that gets up to speak its truth is ultimately brave and should be heard. Hopes that all who write in their bedroom though to those who have written an opus will be heard and venerated because they dared to accept this way to the truth. The proceeds of the $10 entry fee will go to the White Ribbon Organisation. Another chance to hear some great poetry and help the Hunter Women’s Centre! 4-6pm. Gracing the stage with pure feminine energy are the voices of Judy Johnson, Gillian Swain, Anne Walsh, Debbie Robson, Chris Mansell and Louise Berry. Come along and bring a friend or three. 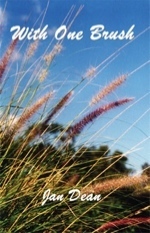 Judy Johnson is a prize winning poet who has published five collections with another forthcoming early in the new year. Gillian Swain has performed in many settings from Newcastle Poetry At The Pub to Northern NSW venues, Woodford Folk Festival, The Nimbin Performance Poetry World Cup (where she won some cash! She was pretty chuffed with that! 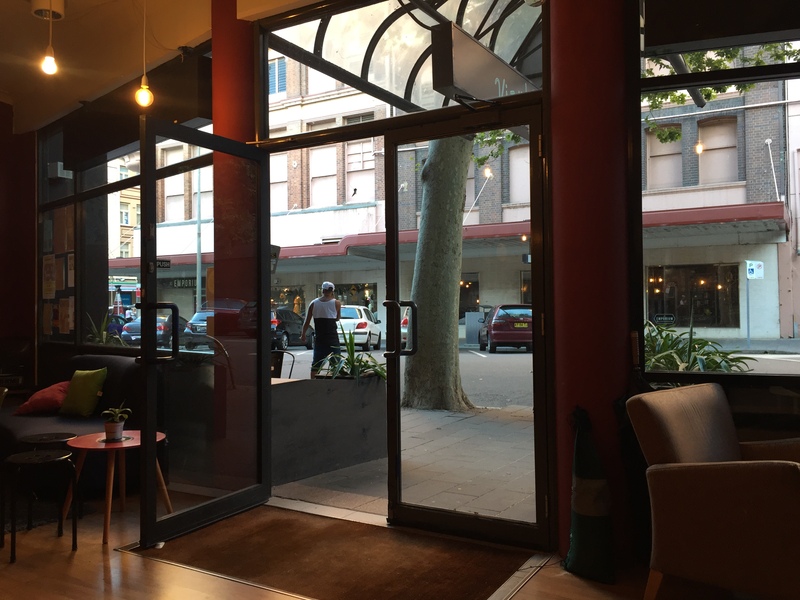 ), Newcastle University Howl events, The Brett Whitely Gallery, The Wharf Theatre in the National Poetry Slam, Newcastle Writers Festival, just to name a few. You can find her work in various Poetry At The Pub Anthologies and in a collection of poems called “Sang Up”, published by Picaro Press. Gillian now lives in East Maitland with her husband and their four children, where they run a successful Coffee Roasting business and an Espresso Bar. Anne Walsh is a poet and a story writer whose work falls somewhere on the border of those two countries. Sometimes she’s a dual citizen and sometimes she has no country at all. Most of the time she is illegal everywhere. All the time she’s a local nowhere. Debbie Robson began writing poetry after the birth of her daughter in the late 1980s. Since then she has had her poetry published in Australia, the UK and the US and performed in Sydney, the Blue Mountains and Newcastle. She has recently returned to writing poetry after a long break. Among Chris Mansell‘s latest publications are Verge, Stung, Stung More, Spine Lingo, and Schadenvale Road (Interactive). Seven Stations (a song cycle with music by Andrew Batt-Rawden) was released by Hospital Hill on CD in 2014. 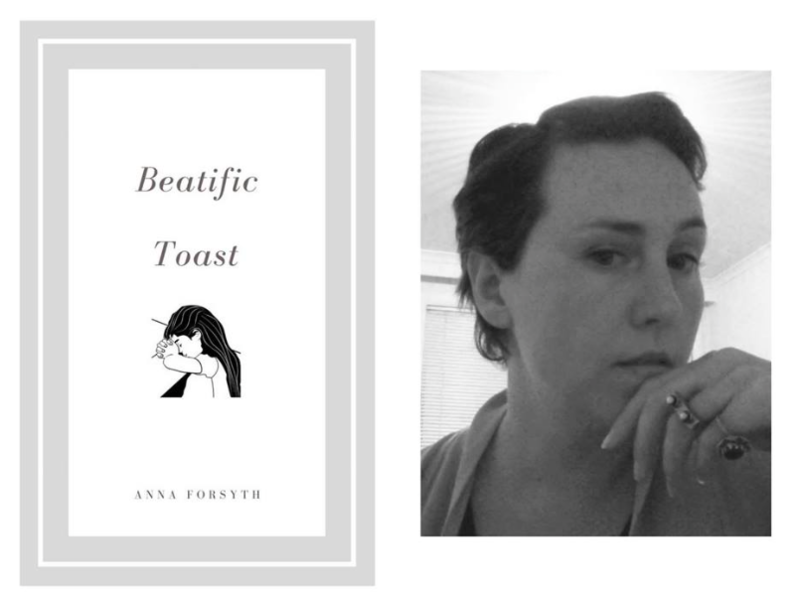 She won the Queensland Premier’s Award for Poetry, Amelia Chapbook Award (USA) and the Meanjin Dorothy Porter Poetry Prize and has been short-listed for the National Book Council Award and the NSW Premier’s Award. Her site is chrismansell.com. Louise Berry is a member of Australian Poetry, Australian Society of Authors, Fellowship of Australian Writers, Hunter Writer’s Centre Poetry Group and formerly a member of Parakeet Poets. She is currently the Convenor of Blue Room Poets and Third Wednesday Poets. She has had her poems published in various anthologies including those from Central Coast Poets, People of the Valley, Wood Brick and Stone, Eucalypt, various Poetry at the pub anthologies, Women’s Work, Food for Thought, Grevillea and Wonga Vine, We are Australians, the first Blue Room Poets’ anthology, Third Wednesday Poets’ Anthology, A Slow Combusting Hymn and Home is the Hunter. She is currently putting together a Third Wednesday Poets’ anthology, Girt by Words, with an expected publication date later in 2016. She is long listed for the Adrian Abbot prize 2016. The proceeds of the $10 entry fee will go to the Hunter Women’s Centre. 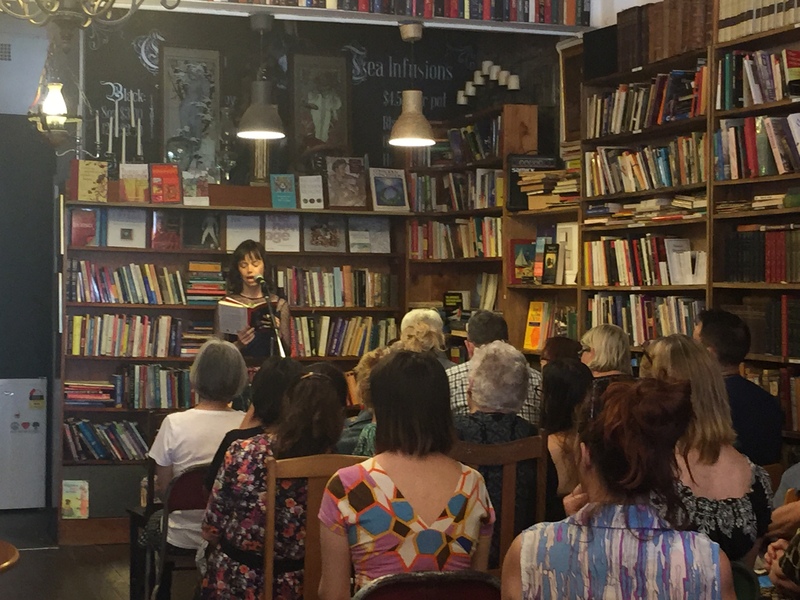 Last week at the Women of Words Poetry Event 1 at the Press Bookhouse Cafe $240 was raised for the Hunter Women’s Centre. Books were donated by Ivy Ireland (reading above) Magdalena Ball and Beth Spencer and used as door prizes. Catherine Knight has been known to dabble in poetry and occasionally share some of that at Poetry at the Pub. Her poems have been described as ‘short’. She is too lazy to try to get her work published or enter competitions. Rhiannon Pryor is still trying to work out what she wants to be when she grows up. She will continue to fake it until she makes it. She believes that dogs are the best people. Sometimes she gets drunk and paints. Sometimes she gets mad and writes poems. Cecilia White is a visual artist and poet who has just completed her PhD at UNSW Art and Design. Her poetry has won the International Cricket Poetry Prize (2011) and received special mention by the Cancer Council Victoria Arts awards (2012, 2013). Her work has been performed internationally and has been published in Five Bells, Famous Reporter, Red Room Company, ETZ Journal and Newcastle Poetry at the Pub Anthologies. Her first chapbook was N THING IS SET IN ST NE (Picaro, 2012). Her next chapbook, with lino prints, is set for early 2017. Jill McKeowen is a poet and essayist, but not much of a publicist. Her poems are in Grieve 2015, Poetry & Place 2015, and the Poetry at the Pub anthologies for 2015 & 2016. She is a member of a Hunter Writers Centre poetry group that meets once a month. She works full- time at the University of Newcastle, where she teaches academic writing across many disciplines from 1st year to PhD level. The proceeds from the $10 entry fee will go to help the Hunter Women’s Centre.